Use the Draw tab in Mail for Windows 10 to take notes on pictures or add a sketch to a message. Add a Drawing Canvas to your message to sketch or add a handwritten note. In the Mail app, create a new message or reply to a message. At the top of the window, select the Draw tab. Put the cursor anywhere inside the message body. Start writing or sketching inside the Drawing Canvas. 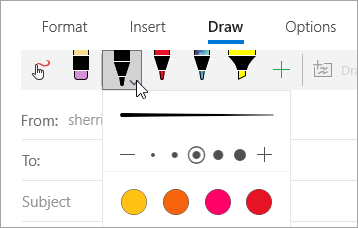 If you don't have a Windows Ink-enabled pen, you can use your finger or another stylus instead. In the Draw tab, select . You can draw directly on an image without first adding a drawing canvas. Start writing or sketching on top of or next to any picture. You can add customized pens to the ribbon in the Draw tab. Choose the thickness and color.